While they may sometime be a necessary measure to provide security and order in a custodial setting (eg to prevent inter-prisoner violence or escape), instruments of restraint pose a high risk for torture or other ill-treatment due to their highly intrusive nature and the risk of causing injury, pain and/or humiliation. They may even be used as a torture tool. 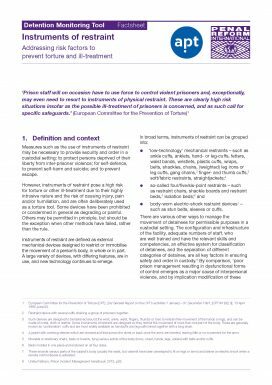 This Factsheet discusses detention monitoring bodies can ensure that CCTV acts as an effective safeguard against torture and ill-treatment in places of deprivation of liberty.